Experts in smart cards and secure technologies, CardLogix works with clients around the world every day, personalizing millions of smart cards each year. With over 20 years of card production and smart card personalization experience, CardLogix has engineered an impressive portfolio of customer-centric smart card services and solutions. Personalizing cards from the inside out, we work closely with clients on a case by case basis to meet unique needs and to ensure that cards look and function as intended within existing or new systems. Electronic Personalization and Graphic Personalization services are offered in house from the CardLogix ISO 9001:2015- certified Card Manufacturing, Programming and Testing Facility located in Irvine, California, USA. CardLogix also offers card personalization and encoding software solutions with ID card printers for instant, in-the-field card issuance applications. See CardLogix’ Card Encoding Engine (CEE). CardLogix first formats the smart card chip to accept data with a card file structure or applets, the manufacturer ID, and date code. Then, we load a wide variety of digital information from biographical data (e.g. first name, last name, date of birth) to biometrics, emergency health records, and more. CardLogix regularly programs smart card chips with either customer-supplied keys or CardLogix-encrypted keys for security applications. 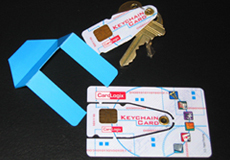 CardLogix loads any form of value to a smart card chip, including tokens. Magnetic stripe encoding is an options for either high or low coercivity cards. Our magnetic stripe cards can be encoded to the specifications set by leading manufacturers of automated banking and hotel equipment for tracks 1,2,3, and 5. We support the 2/5, 3/9, 128-A,B,C, telepen, EAN 8, UPC-A, E, EAN 128, MSI, and ITF barcode formats. Please consult your sales representative for additional details. This type of printing is great for logos and/or user name and address on pre-printed cards (with up to 300 DPI resolution). The following colors can be applied (one per pass): black, white, teal, burgundy, purple, gold, royal blue, process blue, silver, green, warm red, dark red. For mandatory photo applications, such as ID badging, a minimum run of 10,000 cards is necessary. Setup charges are waived on orders of 25,000 or more. Provides a low resolution and low cost option for serialization and is available on larger production runs. Key tags, GSM SIM punching, and tether/badge holes are standard options. Almost any custom shape is possible. Please contact your sales representative for further details. CardLogix provides simple and effective file-level security with a double-blind Key Escrow methodology that protects sensitive everyday data. Offered in either metallic foil or polyester overlays to increase security. Special tooling charges apply. Some applications require additional external methods to verify personal identification. A writeable panel accommodates a user signature and can also be used for entering hand written authorization codes or other dynamic user data. Are especially effective in protecting preloaded PINs and or other customer specific data. A scratch-off panel can be applied to dye-sublimation printing and accommodate up to 10 digits. Card embossing is provided in the standard banking point sizes and font. Tipping is offered in silver or gold and is applied to the embossed characters to make them more readable. Laser Engraving is the burning or removing of material (known as ablation) from plastic in order to create images, text, or machine-readable barcodes. These techniques produce a physical characteristic that cannot be recreated or removed. 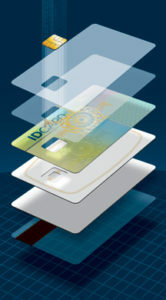 Optically Variable Devices (OVDs) consist of a holographic film or layers applied to a card’s construction. Holograms may have 3-dimensional effects, color changing properties, etc. Holograms and Holomags display images that shift when the viewing angle is changed. They can be embedded or laminated onto the card after printing. CardLogix works with a variety of suppliers to offer numerous designs and options. Why CardLogix? We’re Fast. We’re Flexible. We’re Reliable. We’re Experienced.